This weekend is going to provide a visible opportunity for those who are elected leaders, and those who want to be elected leaders, to use the memory of those who died to preserve democracy to once again show what hippocrates they all are. Why do I believe this? Because while public figures and media honor those who fought and died in traditional wars, few encourage this same degree of personal sacrifice in the war on poverty, racism, and inequality in America. Why do I believe this? Because few will use their daily visibility to encourage citizens and corporations to be involved in community service. The volunteer button and donate button on the web sites of most politicians points to a place where you can learn how to help them get elected or stay elected, not to a place where your time, talent and dollars help a youth born in poverty have a pipeline of adult and business support that assures that he will be in a job/career by age 25. On Monday evening, almost every TV station in America will have a few video clips of local parades and local celebrities who march in these parades. Yet few will point to a place on their own web site where citizens are encouraged to learn about the issues of poverty, or where they can become a volunteer, leader, donor or business partner with a community organization working to help a young person move to a career. A growing number of people understand that, if we want to improve children's education, we must reform the inadequacy and unfairness of our state's school-funding system. But that's only half the work necessary to do the job right, according to a new report by Voices for Illinois Children. A Shared Agenda: A Leadership Challenge to Improve College Access and Success, on the Pathways to College Network web site. These are just a few articles and research reports that can be found in the LINKS and Resources sections of http://www.tutormentorconnection.org and http://www.tutormentorexchange.net. Why we should get involved, only leads to questions of where?, and to how?. Poverty is not something that ends with a sound byte. It takes 25 years for a youth born in poverty today to reach age 25. Statistics show that many inner city kids won't be alive then, many will be in jail, and too many will have dropped out of school and have little hope for a positive future...all because too few leaders today and in the past have been willing to make the ultimate sacrifice to create a system that reaches these kids and sustains consistent support until they are out of poverty and in careers. You can read some of these statistics on the web site of the Alternative Schools Network of Chicago (http://www.asnchicago.org). Thus, we need to also point to web sites where complex ideas are being discussed and broken down to components, like job responsibilities are broken down among thousands of contractors who will be building the new Trump Tower in Chicago. The engineers building the Trump Tower know that first you need a vision, second you need a plan, third you need financing (maybe this comes second), fourth you need a blueprint, and fifth, you start at the foundation, then build the project a floor at a time. In raising kids or ending poverty, the nation has no vision, no plan, no financing, no blueprint, and we're starting all over the place and wondering why we're not being successful. Random acts of kindness don't build a building and don't raise a child. Change will only occur when people learn to get involved and stay involved, often repeating the same actions over and over for many years. For instance, giving money to a tutor/mentor program is an action that needs to repeat from year to year. Foundations that provide seed money then expect someone else to sustain the project are wasting money when no donors come forward to build the next stages of the project. Corporations who want better educated workers, or a more diverse workforce, need to fund the pipeline, from preschool all the way to employment. Focusing workplace payroll deduction fund raising on tutor/mentor programs would be one way to provide a consistent flow of dollars into youth serving organizations. What does this mean to the leaders walking in Monday's parades, or to the media covering them? It means we need to find ways to draw attention to this work every day of the year, not just one day of the year. And we need to use the Internet as a place to host information and connect those who want to help with places where they can be reinforcements. We need to teach reporters, editors, columnist to put web links at the end of each story, so that each story leads to a path of involvement. In October 1992 when six other volunteers and I created Cabrini Connections and the Tutor/Mentor Connection, a little boy named Dantrell Davis had just been shot and killed while walking to school in Cabrini Green. This led to public outrage and full-page stories in Chicago's major newspapers. On the front page of the October 15, 1992 Chicago Sun-Times, the headline was "THE KILLING GROUND". The sub head was "7-Year-Old's Death at Cabrini Requires Action" In this front page editorial, the Editor of the Sun-Times wrote, "This isn't something you can let the other guy be indignant over. It's past time for you to take responsibility for solving the problems of Chicago. Please don't let this be someone else's problem. It's yours. It's mine. Let's retake our city and begin working to solve the horribly destructive problems of poverty, hopelessness and racism." I have this front page posted on the wall outside of my office so that myself and everyone in our organization is reminded of this responsibility every day. Once a year I send this to the Sun-Times to encourage them not to forget. Yet, I'm disappointed that our media and so few of our leaders are using Memorial Day and other public occasions to keep this memory and this challenge alive. I'm disappointed that our leaders and celebrities not yet using the potential of the Internet to connect those who can help with information that shows why they are needed, where they are needed, how long they need to stay involved, and ways they can contribute time, talent, dollars, to win the war on poverty. I want to think that at some parade in the future, some of the heroes that we remember on Memorial Day will be people who dedicated their lives to winning the war on poverty in America and in the world. Maybe if we do that we won't have to have so many young men and women fighting and dying in wars that have their roots in poverty, racism and hopelessness. For nearly 30 years I've been sending out invitations for others who work of volunteer with tutoring/mentoring programs to come together to share ideas, network and collaborate. A few years ago while hosting a conference at a Chicago hotel, a man from another conference at the same hotel stopped by our registration table to introduce himself. He was from Indianapolis and had an interest in mentoring. A couple years after that people from IUPUI in Indianapolis began attending the Tutor/Mentor Conferences in Chicago. It turns out the first person who accident I started talking to, and who I had added to my email newsletter list, had been forwarding my email to others. This shows what can happen by one person creating space where others can meet and network. I hope that some of the people who attend today's even will be new partners and leaders in the Tutor/Mentor movement one or a few years from now. That's our goal in hosting these events. We want to stimulate actions that lead to more and better volunteer based tutor/mentor programs in places where they are needed. You're welcome to join in. It's Free. If you cannot join today, visit http://www.tutormentorexchange.net and join one of our eGroups. The next conferences will be in November, but our focus now is on volunteer recruitment as school starts in August and September. Thanks to everyone who is taking part in today's event, especially to IUPUI for hosting and organizing the slate of speakers. If you participate in today's eConference and would like to provide comments or feedback, please add a comment to this message. Can we meet? Can we find ways to work together? I was getting ready to send this email to a person that I respect as a community organizer. I decided to post it as an open invitation to anyone who would like to work with the Tutor/Mentor Connection. Can we meet again soon to talk about next step strategies? There are many people collecting information that shows how youth and young adults in low income areas are at a disadvantage in moving through school and into jobs/careers. Some have better contacts than others, some have better strategies, and some have better funding. Few do all three. I've been aggregating information and web links at http://www.tutormentorconnection.org and http://www.tutormentorexchange.net. These show the connection between different advocates. While the T/MC Leadership Conferences and eConfereces draw a growing number of people together, I don't have the clout (or skills, and money) to draw many of these different people together on a consistent basis to talk of ways to work together on key points. You might have the facilitation or marketing ability to do this. I attended a Welfare Symposium in Chicago in late April, co-hosted by Jerome Stermer of Voices 4 Illinois Children. More than 200 people were there, including a few dignitaries. I attended a dinner hosted by the Academic Development Institute. Dr. James Comer was the speaker and nearly 100 people attended. I attended a breakfast hosted by Jack Wuest of the Alternative Schools Network. More than 200 people attended, along with Emil Jones, Arnie Duncan and other state leaders. I updated my organization's information at http://illinoisparents.org this morning. I also put the next meetings of the Illinois College and Career Access Network, the Illinois Afterschool Alliance, and the Chicago Coalition for Community Schools on my calendar. It seems that almost every week someone is gathering a group of people to talk about some part of the problem of helping disadvantaged kids move through school and into jobs/careers. There's an overlap of who attends these meetings. It's a small fraternity of people who care and are active in trying to make things better for disadvantaged communities. However too few people are involved and there's a common void. Too few business leaders are at these meetings or strategically engaged in the mission of these organizations. There's also a strategic void. Each meeting focuses on the agenda of each organizer and few use maps of Chicago or Illinois to point to where the problem is as part of a strategy of drawing private and public sector resources on a more consistent basis to organizations in poverty neighborhoods who are already working to help kids move to careers. That's because few organizations are maintaining such databases or mapping the information for purposes of drawing volunteers, dollars, leaders, business partners, etc. directly to existing organizations. In aggregating this information on T/MC web sites I'm trying to fill this void. However, the common challenge we all face is not enough people are paying attention. When I look at the Chicago Tribune and Chicago Sun-Times, the few stories that draw attention to the challenges poor neighborhoods have of raising kids are not connected to each other, nor to the web sites and the meetings each group holds. there does not seem to be a strategy that connects news and commentary to web sites where people can get information and get involved. That means each gathering only reaches a few of all of the people who need to be reached on an on-going basis. We're not increasing the size of this army of concerned citizens fast enough to change the future for kids entering first grade next fall. Only by linking our strategies, our meetings, and our strengths can we create a larger on-going visibility that will not only draw immediate resources (volunteers, dollars) to all of the organizations who need a consistent flow of dollars to build stability and constant improvement into their work, but will also increase the size of the choir of people who are needed to influence public policy and public funding on the state or national level. I may might not be the best person to do the inviting or to facilitate a meeting of all of these people. The T/MC is too small and it's underfunded. We don't have the clout or money to rent out Chicago's Union League Club for a fancy breakfast, or to attract a panel of high profile leaders. I don't need to be that leader if I can find ways where others take that role, and where others link their meetings to on-line forums and to a network of web sites that provide paths of involvement and lead to a distribution of resources DOWN to agencies doing the work in every neighborhood where kids need extra help. I hope that anyone who reads this will forward it to a few other people who might want to take a lead, or support the work the T/MC is doing. Maybe you can help us find ways we can generate new funding so that the Tutor/Mentor Connection can continue to provide a linkage between various organizations via what we do on our web sites and the way we are piloting the use of a GIS to show the connections between groups, ideas and advocacy. You can email me at tutormentor2@earthlink.net if you'd like to talk. On Thursday and Friday, May 12 and 13, more than 140 people gathered at the Northwestern University Law School in Chicago for the 23rd Tutor/Mentor Leadership and Networking Conference. Participants came from California, Texas, Canada, Wisconsin, Michigan, Indiana, Iowa, Illinois, etc. From May 6 to 12 a Tutor/Mentor eConference connected even more people with each other, and with information that we hope helps people innovate ways to connect tutors, mentors and change agents with children and youth living in neighborhoods with high concentrations of poverty, poorly performing schools and many other social/economic barriers that kids must overcome to reach jobs and careers. Another eConference will be held on May 23. This is all made possible by volunteers. The speakers at these conferences are volunteers. People who help organize the events and host the econferences are volunteers. The Conference was co sponsored by the Children & Family Justice Center at Northwestern University Law School, and held at the Law School. 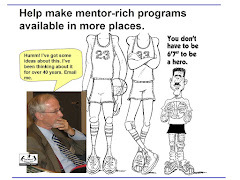 Even the web sites that the Tutor/Mentor Connection uses to host a library of Tutor/Mentor information were created and hosted by volunteers. This shows the potential of civic engagement. The challenge is helping volunteers find information and financial resources to support on-going involvement, while creating a larger, and on-going public awareness that encourages a growth of the number of volunteers who get involved. I've hosted these conferences since 1994 and have led a volunteer-based tutor/mentor program since 1974. I cannot tell you how good I feel when I watch the interactions of tutor/mentor leaders with each other, and of volunteers with teens and youth in tutor/mentor programs. It's because I know that lives are changed because I and other volunteers have helped create space for these gatherings to take place. This blog is a new space. I hope it also helps connect tutor/mentor communities and volunteers with each other and with needed resources. As we head to the next econference on May 23, I hope to continue this process and expand the network of volunteers who are working to create a brighter future for those who were born to more disadvantaged circumstances. "It takes a village to raise a child" is an over-used phrase. However, in the Tutor/Mentor Leadership Conferences, members of this village are coming together to learn ways to create a stronger community of support for children and youth who need extra help. Calling all tutors, mentors! Let's connect. This morning I spoke with one of the people who did an on-line workshop in yesterday's econference and she told me that she'd already told two people about her role in the econference and in the May 12 and 13 conference in Chicago. One told how she'd been helped by a mentor when she was a teen and the other expressed interest in the tutor/mentor networking that we are doing. That's the purpose of these conferences and this blog. There are thousands of people in this country who have been helped by a mentor, or who have been a mentor or donated money or time to lead a tutor/mentor program. Many of these people are no longer active, but have great experiences and loyalties to the concept of tutoring/mentoring. By setting up econference portals and on-line communities, and by hosting face to face gatherings in Chicago and other cities, our hope is that people who attend these events will talk to others and that this will draw others who have been involved into this on-line community where their commitment can turn into actions that help support the growth of tutor/mentor programs in all parts of the country/world. When you read this Blog, or visit a T/MC web site, or attend a conference, all you need to do is tell one or two other people about your experience and give them a web site address where they too can get connected. As we increase the number of people in the conversation we'll be able to brainstorm ways we can share the responsibility for building greater visibility and a more consistent flow of volunteers, dollars, technology, leadership, etc. into every single tutor/mentor program in every city in America. By changing the flow of resources we can increase the quality and the availability of programs. Today another round of on-line workshops were held in the www.alado.net/econference portal. the last one was followed by an extended conversation between four or five people in several different states and two countries. The question was, "how do we find owners/partners to embed reflective thinking forums in hundreds of business, faith groups, social and alumni groups, etc?" I spend a lot of time thinking about what it takes to make effective tutor/mentor programs available in all of the place where they are needed. I draw on research that tells me why we need to do this, maps that show where such programs are needed, and the example of many programs to give me ideas on what types of programs could exist in any neighborhood. 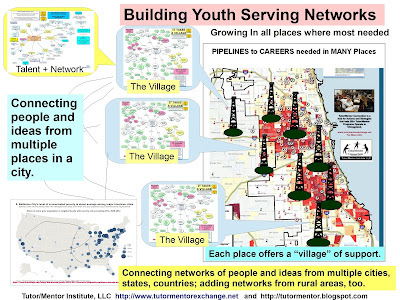 How can we encourage and support this same type of thinking in hundreds of different places, but use common maps and volunteer databases to point people to places where they are needed, and to make it easier for volunteers and programs to connect? Can anyone frame this question better? Chicago Schools Graduation rate low. Media misses opportunity. Today, May 9, 2005, the headline in the Chicago Tribune was "City's college-bound rate a third less than thought, and in the Chicago Sun-Times was "City Schools Study: 47% go to College". Both articles pointed out disturbing information, but neither pointed to additional information that readers could use to know more about the problem, it's impact on Chicago, alternative paths to careers, or ways readers could become personally involved in solutions that help mentor kids to careers. On Friday, April 29, I attended a forum in Chicago titled Youth on the Streets: Lost in the Wilderness. It was hosted by the Alternative Schools Network, The Chicago Community Trust and the Woods Fund of Chicago. I wrote about this in my blog. The research shows that youth who don't go on to college earn far less and cost society more than youth who do go to college. This is just one of many reports that show why people in business, churches, universities, and living in the middle class and affluent parts of the Chicago region, should be reading headlines link today's and looking for ways to get involved. The problem is, too few people putting out the research or controlling the media, are thinking of ways to use the Internet for learning and collaboration and community problem solving. Yesterday I met for about 4 hours with 39 people in an internet chat/networking forum that was part of the Tutor/Mentor eConfernece (http://www.alado.net/econference ). More than a dozen countries were represented. Information shared showed how people can use the Internet to learn and collaborate, while the econference illustrates how anyone can send an invitation and gather people to discuss a specific topics. While I hope others will join the econference workshops today through Thursday, or that others will attend the face to face Tutor/Mentor Leadership Conference being held at the Northwestern University Law School on Thursday and Friday (http://www.tutormentorconference.bigstep.com) , my larger vision is that others will integrate this thinking into their own actions. When someone publishes research and when someone writes a story that calls attention to the problem, both should learn to point to places and on-line forums where people can meet to learn more, reflect on the information and on potential solutions, and find places where they can get involved to solve the problem. We don't have million dollar ad budgets yet we have million dollar messages. If we link these messages to innovation, collaboration and problem solving networks, we can increase participation and results without dramatically increasing expenses. As Merri Dee (WGN TV) is fond of saying, "If it is to be, it is up to me." Each of us should reflect on what this means to us. Certain schools are having success in dealing with formerly low-performing students, writes William Raspberry. But precious few school systems are showing much consistent improvement in educating the children we know to be hard to educate: children of low-income black and Hispanic households, children of single-parent school dropouts -- children, in short, for whose parents school didn't work. What is hard for us to get our minds around is that school improvement is fairly easy to accomplish for children whose parents were successful in school and are enjoying some success in their lives. Threats of retention, loss of privilege, even the prospect of embarrassment, can nudge such parents into more active participation in their children's schooling. But for parents who have not enjoyed success or seriously envisioned success for their children, it takes more than reorganization and parent coordinators and the like. It takes a consistent, nonjudgmental effort to reach and teach parents how to prepare their children for learning. I put this here because it challenges us to think deeper. I post maps and charts on T/MC web sites that show poorly performing schools to be more concentrated in poverty than in other neighborhoods, and to show that kids in poverty don't have the same range of adult mentors and role models in their lives. Instead they have a different mix of role models who demonstrate different, and more negative career aspirations. Blaming teachers, parents and school leaders without creating a more comprehensive adult support system in these neighborhoods is not fair. A comprehensive tutor/mentor program attracts a mix of adults who model a wider range of career aspirations and help open doors for kids who participate in these programs. Unfortunately, there are too few programs in most neighborhoods where they are needed, and too few people in business, government and media who are spending time providing leadership to a mentoring-to-career strategy. Want to talk about this? Post a comment, or join in one of the conference or econference forums that we host throughout the year. The first wave of workshops is now archived at www.alado.net/econference. I joined the portal at 6am and found Phil Shapiro from Washington, DC, and a second person already in the portal. Due to changes in the Saturday schedule, we had decided to move my presentation from Friday at 7am to Saturday at 6:30 am Chicago time. This is so the group in Thailand can participate live. Since Phil was already in the portal, we had a nice one-on-one conversation. He had never used this technology, so was able to get a good feel for how it works and how he might use it in DC. Phil is an active Digital Divide.net blogger, which is how we first met. I hope that through this round of networking I can meet one or two more friends with as much passion and talent and commitment to helping others as Phil. It's off to work now to prepare for next week's conference. I hope you'll visit the econference and view the archive and that you'll join us tomorrow for more econferenceing. Tonight at 2am Chicago time the May 6-12 Tutor/Mentor eConference will be launched by Lukas Ritzel who will be delivering a live welcome from his home in Switzerland. I'm afraid I'll need to look at the archive to hear that. I'll be in bed!! My welcome will be delivered tomorrow at 7am Chicago time. I hope you have some coffee and will join me. If you are not able to participate in a workshop when it is live, you'll be able to log in later and review the presentation. If you come to this blog, you'll still be able to ask questions. It's exciting to see so many people from around the world joined together in this common effort. Credit for putting this together goes to Andrew Pincon of the Digital Workforce Education Society of the City Colleges of Chicago. I hope you'll join in workshops, and add your comments in blogs hosted by myself and other speakers. I'm hoping to have a Directory available by Saturday that will enable anyone who enters an econference portal to register and post an introduction of themselves. This will enable any participant to directly contact any other participant, during or after the econference. For those planning on coming to Chicago for next week's conference, this will help you make plans to meet people you may want to meet. The space is now open. We've done all we can to attract good speakers and to send invitations to thousands of people. It's up to each of you to make this work. Have fun! I hope you meet some new friends. There's lots of talk about collaboration these days, yet unless someone maintains a database of interested parties, and sends out an invitation for people to come together, it's not likely that most of the organizations that might collaborate will every meet often enough to build a shared understanding of issues, along with the trust and understanding needed for a collaboration to work. In fact, it's highly probable that most of the organizations who might collaborate and learn from each other will never connect. For more than 30 years I've been building a database of people involved or interested in volunteer-based tutoring, mentoring, as well as those interested in school reform, poverty reduction, workforce development, diversity, civic education, democracy, etc. Prior to the internet my database included Chicago and Illinois based organizations. Now it includes organizations in all parts of the world. One of the strategies for building this network, and for helping organizations meet, build shared understanding, trust, etc., has been to invite people to come together every six months for Tutor/Mentor Leadership Conferences. As Internet collaboration and elearning tools have become more available to small non profits, we've begun to move part of the conference to the Internet, meaning more people from more places can connect with each other, and with those who attend the conference in Chicago. More importantly, they can stay connected, which is essential to putting the learning to work. On Friday, May 6 the 2005 eConferences will begin. Visit http://www.alado.net/econference and you can find a schedule of workshops being delivered from different parts of the world. As you participate, I encourage you to come back here to blog your comments, or to connect and network with others. If you host your own blog or list serve, set up your own space for information sharing and networking. Tell me about it and I'll add your link to the links list on my blog. These links will remain in place after the conference to encourage continued networking, elearning and collaboration. The eConference is free. Participate as much or as little as you like. We've created the space. It's up to you to make it work for you and your organization.